Purchase this product now and earn 2,200 Reward Points! 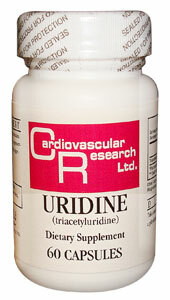 Ecological Formulas/Cardiovascular Research Uridine Triacetyluridine Capsules contain the mitochondrial catalyst uridine. The product contains no preservatives, chemical additives, or any other allergenic ingredients.